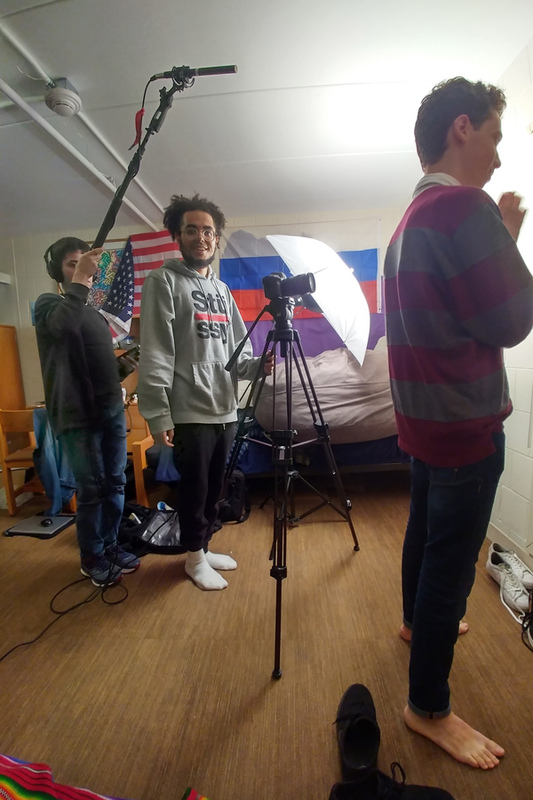 Students film the pilot of “Putin Jr.,” a new NU Channel 1 web series. The show follows Ivan, Putin’s fictional son, as he traverses the social complexities of college and tries to keep his lineage a secret from friends. You think you have it rough with your parents? At least your dad is not the President of Russia. The fictional struggles of Vladimir Putin’s illegitimate son are the premise behind “Putin Jr.,” a new web series for NU Channel 1 created by Communication sophomore Chase Reed, who is a Daily columnist. The series follows Ivan, Putin’s fictional son, as he traverses the social complexities of college and tries to keep his lineage a secret from friends. Reed said the idea blossomed from a skit he created for a Radio, Television and Film class, in which his friend went around telling everyone he was from Alaska. The team behind “Putin Jr.” is currently shooting the show’s pilot. Reed said filming is a grueling process that requires long hours from everyone involved. “It’s the reason why I’m taking a nap at five in the afternoon on a Sunday,” he said. Reed said the pilot will primarily focus on establishing Ivan as a character before he has to grapple with whether he becomes an accomplice to his father’s devious plans. Reed said he intentionally made Ivan “an everyman” so that viewers could connect with the character once the drama comes into play. While the show is currently in early production, Reed plans to extend it into a six-part web series and let the show evolve with the developing news cycle around Russia. The Kremlin has been a recent point of discussion due to its alleged interference with the 2016 presidential election. Communication senior Erin Gregory, an executive board member at NUCH1, said Reed has been a great collaborator and remained open to advice from senior members of the group. She added that she was excited about the prospect of a new full-length series for the channel. “We haven’t had a web series since (the Northwestern Sketch Television) Premiere in February, so we’re all really excited about this,” Gregory said. When crafting a show, Reed said he mainly focuses on crafting a narrative. He said he often gets his ideas in dreams or while in the shower, and, above all, his comedy has to stick to a central storyline. This emphasis on narrative has allowed Reed to create a unique, hodge-podge sort of comedy. Reed added that he has faced the same difficulties many contemporary comics currently deal with: how to create satire when reality is stranger than fiction. The only way to address this problem, Reed said, is to “amp up” the surrealism and make everything larger than life. However, he said he has difficulty finding ways to amplify cartoonish qualities of actual life. Though “Putin Jr.” deals with many political themes, Reed said he doesn’t want to make the show too politically driven, as it is mainly a piece of satire.